We were away last week so it has been two weeks between Tuesday views. This scene was taken at today at 8:29 a.m. Again the sunlight has found the tops of the trees but has not yet entered the garden, the contrast making for a poor quality photograph. The sun is not actually so harsh as this looks, but the image underscores how on summer mornings moments in the garden are best enjoyed during this early shady period. The fescue grass is dying back, patchy with brown spots and an annoying annual grass has snuck into the lawn over the past several years. It grows faster than okra and cannot be kept trimmed. One of the original thymes along the path has turned completely black the last two weeks. It began discoloring after I trimmed around the pavers, so perhaps I damaged it but I think it is stressed from the weather. In past years it has recovered but it looks messy now. The Pink Chintz thyme in the center is still blooming and Angelonia contributes lots of color. Overall the garden is in retreat. There will not be much to see from here on out until early spring when bulbs start peeking out again. 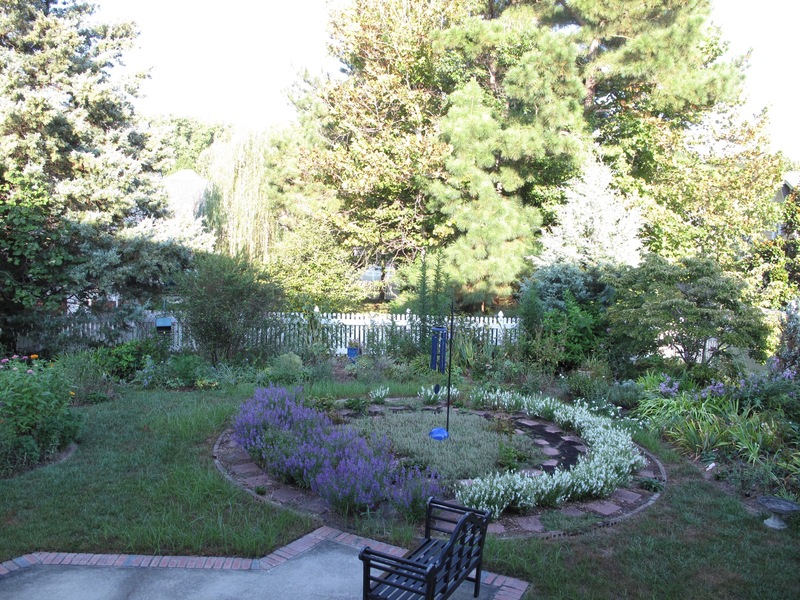 This entry was posted in garden and tagged meditation circle, meditation garden, meditation path, thyme, Tuesday view on August 23, 2016 by pbmgarden. Thanks Judy. Oh, I hope you can get your plants safely moved. It’s distressing when conditions change like that and you have no control over it. Looks great, I love that combination of half white, half blue. Thanks Anca. I’ve thought about doing it all one color but it would be hard to pick one. That circular feature is very photogenic throughout the year and a good indication of the changes in the garden. Thanks. You’re dedicated to get out and walk during those hours. Good for you. 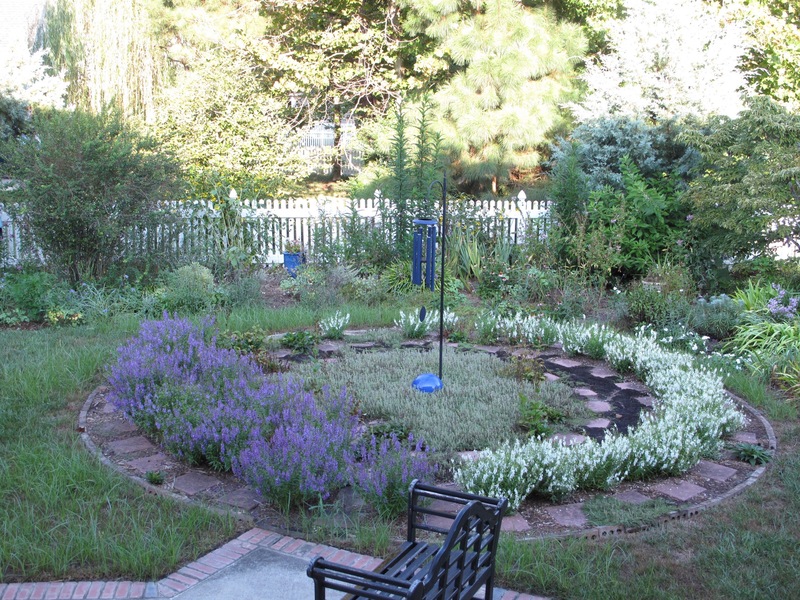 I’m happy the meditation circle has turned out to be a good focal point for the garden. The morning light is harder to capture than evening I think, it looks really good this week. Thanks Christina. In just the one week we were away the garden really changed drastically. Must have been a very hot, dry week here. I can’t complain this year though. I think it still looks good Susie. I cut my Thyme right back this week as It gets all straggly if I don’t do it early enough. I hate having bare patches but it should send up new leaves soon once it cools down a bit. That morning shade looks very inviting. It’s hot here too! Have a good week! Looking at the photo, I don’t see the imperfections of which you speak. Looks perfectly lovely to me. Thank you Ricki! Sadly, they’re all there and more that I didn’t even want to point out. I’m always discouraged by my garden by this time in the summer and not much interested in working on it. I had patches of thyme burn out like that this summer too. I blame a combination of intense heat and insufficient water. I finally gave up on it coming back on its own and bought a new flat to replace it last weekend. Kris, hope your new thyme takes off and is happy. The last three weeks have been very hot with little rain so maybe that finished off the thyme in the circle. Some of the thymes are doing fine though. It’s a wistful observation to notice the season has swung, but the light is different now. Annuals are great for extending color until frost. I think you are underestimating how nice the angelonia has filled in. It looks great and seems to show no signs of slowing down. When I get tired of the garden I trim it all back to an inch or two and spread a little new mulch. What a difference it makes to my mood and many of the plants respond with fresh, clean growth which looks so refreshing. It might be nut grass; I’ll have to get some help with evaluating it. Mulching is a great way to perk up the garden. I’ve done a few sections but need to finish the entire job at once to get that satisfying effect.